The TDI Law Enforcement Knives are optimized for low profile or concealed carry and are effective for close quarter's defense. What makes them so good? There are a lot of carefully thought out factors. Grip: The angles, textures and contours of the grip are just right for easy access and a firm hold. The knives are designed to prevent the hand from slipping and overriding the blade. Blade: The shapes and sizes of the blades maximize instinctive moves during a confrontation, whether using in a forward or reverse grip. Holster: (Sheath) The sheaths and knives are ambidextrous and can be worn on either side of the body-at the weak or strong hand. This knife is found by the hand easily, comes into the hand efficiently, and does the job needed well, all in the cramped, confined chaos of a fight. 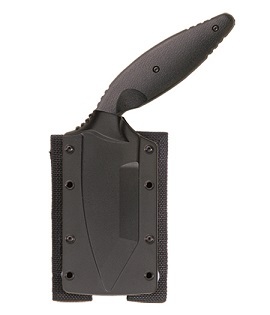 The friction release sheath can easily be mounted on a belt, a vest, or be mounted to body armor using the secure Velcro & Snap Molle straps included on the back. To view all of the TDI self-defense products click here. This knife model is eligible for custom laser engraving.